Quitting smoking is hard, but you don’t have to do it alone. There are many resources to help you quit! One such example is the Smoke Free app. This free app is available for both iOS and Android devices. This app was developed by a PhD candidate studying for his doctorate in psychology. It utilizes over 20 different evidence-based strategies to help you quit and stay quit. The app tracks your quit progress through your dashboard, which highlights your statistics, diary, progress charts and badges earned as you remain smoke-free. Upon downloading the app, you’ll be asked to read a disclaimer and agree to participate. It basically states that the information you provide the app will be used as part of research to develop and evaluate tobacco cessation programs. All of your information is kept anonymous and private, but you can use the app even if you decline to participate in the research. Next, you’ll be asked to complete an introductory statement that asks questions about you and your smoking habits. These include: your age, number of years smoking, the price you pay for a pack of cigarettes, number of cigarettes in the pack, how many cigarettes you smoke per day, your anticipated quit date, how soon you smoke upon waking up in the morning, education level, and gender. All of this information is modifiable and located in settings should you wish to change any of it, including your quit date. Then, the app will calculate the information on your dashboard where you’ll see how much money you’re saving, time you’ve been smoke free, years of life regained, number of cigarettes you’ve abstained from, and cravings you’ve resisted. Don’t worry if you haven’t quit yet; as you progress in quitting and completing your diary, your dashboard statistics will change. Completing your diary each day will help to keep you accountable to your goal and accurately track your progress. Your progress is recorded under the “progress” tab and will show you the length of time you’ve been smoke-free up to the second. It’ll also display the status of your health, the amount of money you’ve saved, and how many cravings you’ve resisted. You can earn badges as you complete your diary and continue in your endeavor to quit. All of these features can help keep you motivated during your journey to becoming smoke-free. This is a straightforward app with a streamlined display that provides the basics to help you quit. It may be appealing to different types of quitters, such as those more concerned with monetary benefits of quitting and those concerned with the health benefits. The up-to-the-second data is helpful as you don’t have to refresh or reload to obtain it. The diary feature is a great tool to keep you accountable to your goals, and it doesn’t require too much time to complete. You can set reminders to help you follow through with your diary. There are no pop-up ads! It can be confusing to find the different parts of the app, but once you are familiar with it, you’ll have no problem. Smoke Free is easy to use, but its simplicity may get boring with long-term use. While the app provides you with many tools to quit, one part that is lacking is support. There is a forum located on the Smoke Free app website, but it would be even more helpful if it was available within the app. It would also be helpful if the app provided you with information about how to conquer your cravings in addition to tracking them. If you’re looking to quit smoking, this app is a must-try. It provides you with an easy, straightforward approach to quitting smoking without too many bells and whistles. Being able to see both the monetary and health benefits of quitting is encouraging to help you remain quit. If you’ve tried to quit before and know what to do, but need more accountability, this app can help. If you’re trying to quit for the first time, this app can be equally as helpful, but be prepared to seek out additional guidance as far as developing a quit plan, overcoming cravings, and finding support. If you’re a Health Advocate member with access to our Wellness Coaching program, connect with a Wellness Coach for additional tobacco cessation support and information. 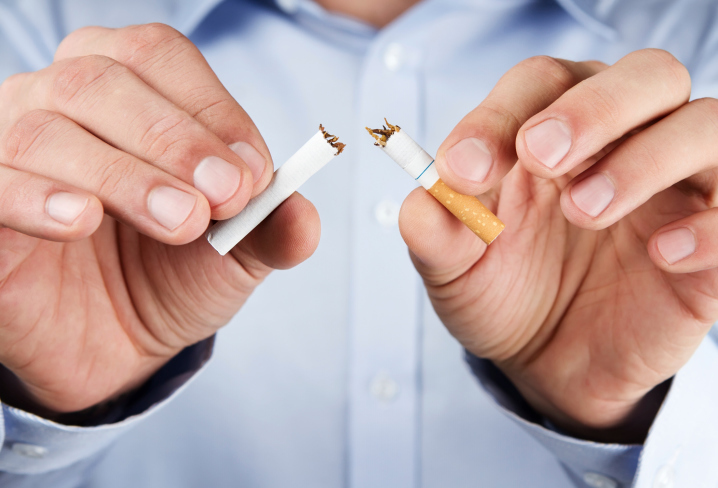 Health Advocate Wellness Coaches have undergone extensive tobacco cessation training to help you quit for good!